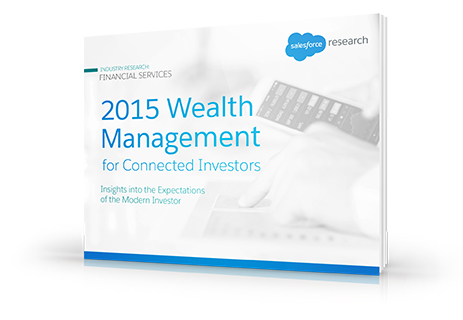 To explore current attitudes and methods in how Americans today communicate and manage their investments with financial advisors, Salesforce Research conducted its 2015 Wealth Management for Connected Investors report. With more than $2 trillion in financial assets shifting hands between baby boomers and their Gen X and millennial offspring over the next five years, the report found that advisors who emphasize new communications channels, collaborative investing and other technologies in working with their clients stand a better chance of capturing new investors and retaining existing ones. Download the report to review data from more than 1,000 participants and learn from the millennial, Gen X and baby boomer expectations for wealth management, including technology tools that are most in demand, preferred communication channels by generation, reasons clients leave financial advisors, the most important factors when selecting a new financial advisor and much more. Download the report to review data from more than 1000 participants and learn from the millennial, Gen X and baby boomer expectations for wealth management, including technology tools that are most in demand, preferred communication channels by generation, reasons clients leave financial advisors, the most important factors when selecting a new financial advisor and much more.